Mortimer Commodity College in South Shields. 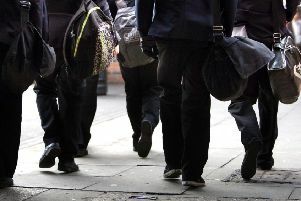 Parents have been warned to ensure their children are safe after three seperate reports of a white van approaching pupils at a school. Staff at Mortimer Community College in South Shields issued the warning today after the vehicle reportedly approached pupils on Monday, Tuesday and yesterday. All of the incidents occurred in the Chichester area and both girls and boys were approached. The text read: "We are currently working with local police with regards to safeguarding concerns in relation to a white van approaching students on their way from school. Students have been given advice on how to stay safe when walking to/from school." "Please reinforce this message. Thank you." Police patrols were also carried out in the area today. A force spokesperson said: “Police have received three separate incidents in which it has been reported a suspicious van has approached young people in South Shields. “The incidents were all reported in the Chichester area between Monday (September 24) and Wednesday (September 26) this week. “Enquiries are ongoing and extra patrols are being conducted in the area to offer reassurance." A mum of a student in Year 7 said: "There were a lot of police cars around the school this morning, which I thought was unusual when I dropped my son off. "I hadn't checked my phone until much later in the day then I read the text, so it made sense. "It's good to know both the school and police are taking the matter seriously." Anyone with any concerns is asked to speak to a nearby officer or contact police on 101 quoting log 780 260918.